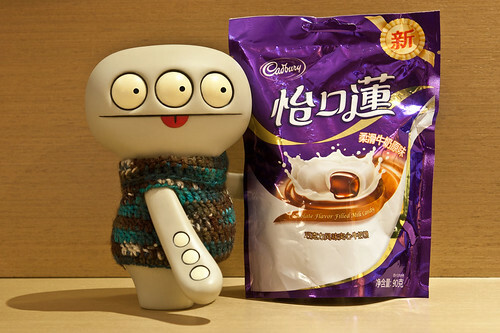 Uglyworld #2089 - Milk Candies - (Project Cinko Time - Image 291-365), a photo by www.bazpics.com on Flickr. Afters my drinkerings maramathon yesterdays I didn't gets up outs of bed untils lunchtimers, at which points I findereds a note from Baz sayings that he didn't wants to wakers me up , that I should meets him at the office to heads back to Shanghais and more importantlies he had leavereds me a treat as I had missereds breakersfast. "Milk candies, woooohooo, I loves milk candies!"